Pepijn studied graphic and typographic design at the Royal Academy of Fine Arts in The Hague, The Netherlands (Koninklijke Academie van Beeldende Kunsten, Den Haag). After graduation Pepijn focused more on illustrating and painting. This was the beginning of Cirque d’extraordinaire or what later became his alias and studio name ‘Cirque de Pepin’. Pepijn’s circus, as a metaphor for a place where anything can happen. Pepijn’s works combine different influences. We see colorful, detailed paintings, drawings and ceramic sculptures, of dressed mice, owls, Chinese dragons and other animals and fantasy creatures. They seem to have stepped out of a fairy tale world. The imagery is that of the comic strip, and often humorous. Yet they are anything but childlike images, that only reassure or amuse. They are not so much comical. But perhaps rather tragicomic, with a deeper meaning, which is rooted in history, or historical stories. Themes that regularly return are vulnerability and finiteness versus the power of humans, animals and nature. The work, which starts with an illustrative sketch, is usually based on a historical fact or character, where the fantasy of Pepin eventually runs away with. Pepijn mixes past and present in a playful way, whereby the spectator is put on the wrong path. He often uses light-hearted humor to relativize the world and to better communicate the meaning of his work. In his sculpture ‘Woodman’s Journey’ his romantic longing to discover the world of ceramics and other cultures as a 19th century globetrotter coincides in the figure of Woodman. Woodman is based on the fairy tale characters Pinocchio and Tinman, and has just as them the desire to be a real man with a real heart. It is a touching little wooden man, with a key in his back, daydreaming, sitting on his wooden toilet. Making a journey into his head. Woodman’s journey is also the name of a major project. In this project Pepijn is researching historical ceramics from the four winds to use in his own ceramic artworks. Northern European pottery, Chinese porcelain from the Ming and Qing dynasties from the east, Italian majolica from the south and from the west 19th century French and English pottery. Pepijn has done his research in 2010 as artist-in-residence in China. And the results of this artist-in-residence are shown in various exhibitions in the Netherlands and China in 2011, 2013 and 2014. In this way, the sculptures, made by Pepijn, became the souvenirs, which Woodman has brought from his travels. Socalled table pieces, meant to tell strong stories about. Woodman in this case is actually a self-portrait, because Pepijn also considers himself a bit of a dreamer. solo exhibitions in The Netherlands, most recently ‘Cirque de Pepin, The Greatest Show on Earth’ in the Koornmarktspoort, city museum, Kampen (2014). 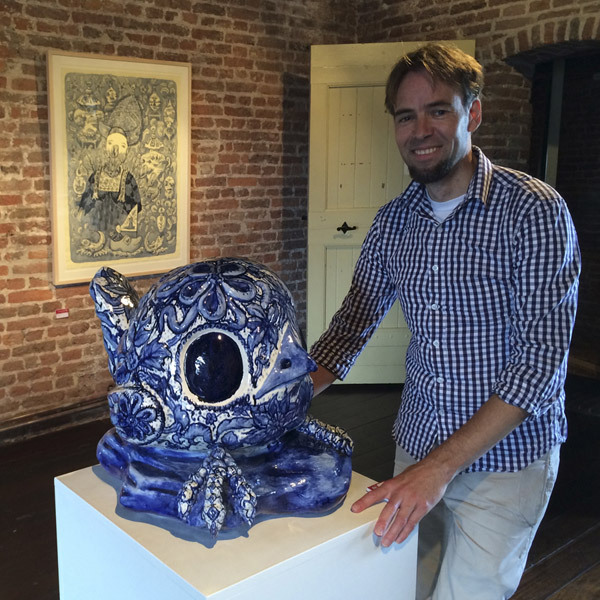 He has participated in many group shows in The Netherlands and abroad, notably at the ‘The Blue Revolution Delft-Jingdezhen, 400 years exchange’ show in Delft, Jingdezhen and Dongguan, China; GROW UPS, groupshow in The center for creative communications (CCC) in Shizuoka te Japan (2010) and Indigo Monster at La Lanta Fine Art, Bangkok, Thailand. museum, Jingdezhen, China, Heden Den Haag and in many private collections. Van den Nieuwendijk is represented by Kochxbos gallery Amsterdam, gallery Nasty Alice Eindhoven and Mothership (art agency), Rotterdam. Pepijn lives in The Hague with his wife Mariam and two sons Milo and Elias. 1 / Adolescence and Childhood are a basic period of the life during which everybody built its own fondation. What kind of teenager were you? I was a average looking, rather shy, and a bit nerdy Dutch teenage boy with some exceptional hobbies. In my spare time I used to spend almost every minute on archaeology. The small town where I lived with my parents has an impressive history dating back to the Roman empire. So I took my shovel and started digging on construction sites in the old city center. Over the years I collected ancient artifacts, mostly pottery shards, and I helped out at professional excavations. I have built a nice collection over the years (from Roman “Terra Sigilata to 17th century “Delftware”), okay it was a bit illegal digging but it was great fun. Since then I am interested in old ceramics. At home we had many art books, my dad, art teacher and painter, was interested in mostly modern art and especially pop art, and so I developed, like every teenager does, a love for the opposite. I became very interested in ancient art, from all cultures. But it started with European art. One of my favorite artist as a teenage boy was Felicien Rops, and looking back, as a young teenager I must have liked it mainly because he was drawing and etching naked women so often. 2 / What’s words would you use to describe the concepts of your current work? I find it hard to tell what the general concept is behind the work, each sculpture or painting tells its own story. Maybe fragility and strenght are good words to describe my concepts. Fragility and transience of us human beings, animals, nature and the strenght and power of strong characters that appear in the works. In the sculpture lady and her dwarf the Lady is a duck with the appearance of a 16th century wealthy lady (or queen, Elizabeth I was a important inspiration), she looks strong but she is actually frail, sitting in a marble wheelchair. Her personal assistant is an angry looking little mafia duck. I love contradictions. And this is also present in the material. Clay and ceramics are fragile but yet very strong materials. I like to play with these contradictions. In my new sculpture Woodman’s journey, the character of Woodman is based on both Pinokkio and the Tinman from the wizard of Oz, they are strong but still fragile characters, they don’t have a real heart, but they would love to have one. The “journey” of the Woodman’s is a journey in his own mind (to find a heart), he is dreaming while sitting on his wooden toilet. Maybe it’s a bit of a self-portrait, because I might be a bit of a dreamer too. 3 / A kind of joy, lightness or cheerfulness – with a sense of humor – are very presents in your work… Right? Wrong? Humor is important in life because it can put things in perspective. A sculpture or painting has to give me personally a good feeling. When I create a work of art and it gives me a good feeling or makes me laugh while designing the work then I have the feeling that I’m on the right track. And most important when a work makes other people laugh or gives somebody a good feeling or a feeling of amazement I am most pleased. It’s fine as a sculpture radiates joy, but I like it when there is a little thread, there is two sides on a coin: the girl from… looks pretty funny or comical but still she is a dead girl. 4 / Which sorts of possibilities does those feelings offer you ? And are you especially working on it? I am not directly aiming on making humouristic, funny or cheerfull works, but since I have a background as an illustrator with a love for comic books somehow my primarily sketches almost always end up as comic illustrations, and therefore the final artwork has something of that as well. I like to think of the works as tragicomic. Funny but with a serious twist (or the other way around). People sometimes ask me if I am making these works especially for kids. It is the best if everybody can relate to the works and especially kids, because kids do not have prepossessed idea’s about art, and they just give a basic opinion or judgement on the artworks. My own two little boys are very honest when they think a new artwork of mine is ugly, they just tell me “I don’t like this one”. My favorite themes are nature, animals (in clothes), knights, portraits of kings or sultans (I am crazy about old miniatures from Persia, India and Mediaeval Europe), natural history (Mammoths! ), death (or rather skeletons and skulls because they’re so funny to draw or to sculp), circus (the reason why I use the alias Cirque de Pepin) and pigs with a trunk. 6 / Your art seems based on our collective visual memory. Am I right ? Or not ? Yes you are right I think, because my inspirations come from mostly historical topics, popular culture and global culture, my works may have a recognizable impact. I get my inspiration from my own collection of 19th century books and magazines on natural history, ethnography, religion etc. and my little collection of archaeological objects. My art is never literally based on historical facts or already existing images, I try to create something that doesn’t exist or exists in another form. I like to play with these different cultural elements, and it is like putting them in a blender and what comes out has a recognizable texture but a different smell. For instance my sulpture Vliegenpaus is based on religious statues that you can find anywhere in the world, I think I turned Saint Joseph into the “Pope of flies”. This one started out as a sort of comment on idolization of religious sculptures, although I am very fond of religious statues of different cultures. 7 / Could you take us through the process you go through to create a sculpture? I have this big machine in my studio, and when I press the green button on that machine then after a while an enormous sliding door opens and a ceramic sculpture comes out. No ofcourse it’s a little more complicated than that. It always starts out with a simple drawing in my sketchbook, which I always bring with me wherever I go. This drawing is a starting point for more detailed sketches. When I am convinced that this peticulair sketch and idea has to become a sculpture and not a painting (a desision that can be hard sometimes) I make a scale model (especially for the larger sculptures). After that I throw a big pile of clay, and start modelling. The modeling takes usually a couple of weeks for a large sculpture. During the modeling I often make adjustments to the original idea and change things that were present in the original scale model. Detailing the piece is the most fun (adding ornaments in clay). When the modelling is ready the work has to dry a little till the clay is firm. Then I cut the work in large pieces (that is the scary moment), and every part is hollowed out. When the parts are completly dry after a month or so they are ready for the first firing, the ‘bisque’ firing on 1000 degrees. During the drying I usually work on colour testing for the glaze. After firing I apply the glaze. Then the parts are fired again on 1160 degrees . Gold or silver requires a third firing on a lower temperature. When everything is ready I have to assemble the work. When the sculpture will be placed on a temporary exhibition I assemble the work with glue and cable ties so I can later dissamble it easily. For a permanent work in public space the entire sculpture is placed on a concrete base and completely filled with concrete. I do most of the work myself, but in collaboration with a small ceramic studio in The Haque who specializes in making monumental ceramic sculptures, and a small Italian family business nearby who are specialized in “Terrazzo” and concrete. 8 / What kind of strength must have an artwork to be really convincing ? With the bigger sculptures colour is very important. A colourfull work in public space draws attention, especially in between grey concrete and dull bricks. For my free work it is important that the shape, details and colour are in balance. For me the fact that there is a first impression of curiosity for the viewer of an artwork, and a second when the viewer looks more closely and sees an additional layer of the story in the details. For instance Afterwar Delight is a bookreading blue rat, but if you see that he is reading a joke book it ads something extra to the story, but you have to look closely then. 9 / Is that these are unique pieces? Or multiples? All my larger sculptures are unique pieces. The Fuping bird sculpture was created as a series. I use a plaster press mold to make the sculpture. The blue painting of the sculpure is slighty different with every piece, because it is painted all by hand. Currently I’m working on an assignment to make 25 small blue and white dragons in ceramic boxes, and they are slipcasts, I can make many of them but they will still be unique pieces because every dragon is painted by hand. 10 / Would you say that there are some recurrent aspects in your work ? Are there any narrative themes that tend to show up or repeat themselves in your work ? Important narrative themes in my work could probably have something to do with war, or the power ruling over other (people). Uniforms, helmets, soldiers and golden epaulettes, and two pigs with a trunk trying to christianize the Red Planet (although nobody lives there). These characters were based on Porkuss a small fetus of a pig with an elefant trunk in a Dutch museum. Porkuss has appeared in some of my earlier paintings. Mammoths are a favorite theme, I hate the idea that they have become extinct by humans, but I like to fantasize that they were still on earth in for intance Medieaval times. In my paintings a fictional nature is a important theme: ornamented blue birds, a red owl, an albino bear or dead brown fishes. 11 / What were the main reasons for « divIng into the painting » like you do in your life ? Probably I would not have done differently if I had the choice. The way to painting and sculpting was a long way, from graphic design to illustration and from there to painting and later sculpting. There is no way back for me, painting and sculpting is really keeping me alive in difficult times, it keeps me dreaming. 12 / Do you have any concluding thoughts that you would like to express ? I am a man of details and therefore I wish everyone had more attention for the little things in life (and in art). There is so much beauty in the details and in our busy and computerized times people tend to leave small things aside, and only look for the bigger picture.